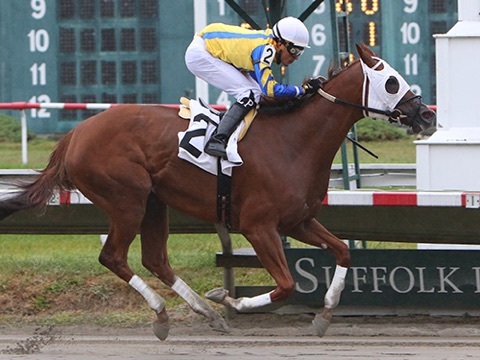 In addition to offering purses of over $500,000 per day and lucrative starter incentives for trainers and owners, Suffolk Downs has established a $5,000 Jockey Challenge for each weekend of live racing this summer. The track is scheduled to hold three live racing and food truck festival weekends – June 9-10, July 7-8 and August 4-5. The jockeys will be awarded points based on the their finish position in a race with six points for finishing 1st, five points for 2nd, four points for 3rd, three points for 4thand two points for 5th. For any finish between 6th and last place, one point will be awarded. At the end of the weekend, the three jockeys that accumulate most points will be awarded a cash bonus of $2500 for 1st, $1500 for 2nd and $1000 for 3rd. “We are looking forward to welcoming back some familiar members of the jockey colony as well as some new faces and hope that the Jockey Challenge will add another level of excitement to the weekend,” said Lou Raffetto, Senior Racing Consultant to Suffolk Downs. In addition to live racing, the three festival weekends are scheduled to include food trucks, family fun activities and live music. Post time is scheduled for 12:55 p.m.
East Boston, MA — Live racing will return to Suffolk Downs this summer with three two-day racing festivals and the track announced today a purse increase of 15% on overnight purses. The three festival weekends are scheduled to be held June 9-10, July 7-8 and August 4-5. In 2017, the track conducted four weekends of live racing with an average daily purse of $493,095, including incentives. The track offered lucrative starter incentives for trainers at $400 per horse and owners were rewarded with $500 for horses finishing first through fifth (on top of purse money) while the owners of horses finishing sixth through last received a bonus of $1,500. This incentive program will continue in 2018. With the 15% purse increase for 2018, $5,000 claiming races will now carry a purse of $30,000, maiden special weight races will offer a purse of $47,500 and allowance/optional claiming races will be listed at $52,500, pending approval by the Massachusetts Gaming Commission. The track is also scheduled to host a stakes race both weekends in July and August and those black-type events will have a purse of $100,000. The first weekend of racing, June 9-10, will coincide with the third leg of the Triple Crown, the Belmont Stakes. Over the course of each weekend, there will be stakes races restricted to either horses foaled in Massachusetts or sired by a Massachusetts-based stallion. Each offers a purse of $50,000 and is a showcase for the Massachusetts Thoroughbred breeding industry. In addition to live racing, the track will be hosting a food truck festival each weekend featuring food trucks from a variety of local vendors, craft beer, live music and family fun activities for the whole family. Suffolk Downs hosted the final of four scheduled live racing and food truck festival weekends of the year and concluded the 2017 season on Sunday with a nine-race card. The day started with the $50,000 Thomas F. Moran Stakes, a seven and a half furlong turf contest restricted to horses bred in Massachusetts. Silent Waters, a four-year-old son of Silent Name (JPN) bred by Nine Maple Farm, Inc, made every call a winning one and drew off to win by seven lengths under jockey Rosario Montanez for trainer Carlos Martin. Silent Waters returned $3.20, 2.20 and 2.00. Danly’s Dream, the defending winner of the Thomas F. Moran Stakes, paid $3.40 and 2.20. There was no show wagering. In the eighth and featured race, the Linda Rice-trainee Nite Delite notched the seventh victory of her career with a one-length victory. The five-year-old daughter of War Chant stalked the pace under jockey Mike Luzzi before launching a bid and battling with a resolute Maggiesfreuddnslip in the stretch. She stopped the clock in 1:00 over a yielding turf course. Nite Delite paid $3.40, 2.40 and 2.00. Maggiesfreuddnslip returned $6.20 and 3.20 while Elandess paid $3.00. The 2017 live racing season at Suffolk Downs consisted of eight days of live racing featuring $4 million in purses including stakes races forMassachusetts-bred horses. The track intends to operate a similar live racing schedule in 2018. Suffolk Downs remains open for simulcasting year-round. East Boston, MA — A total of 204 horses have been entered over two days as Suffolk Downs will host its fourth and final racing and food truck festival weekend of the year this Saturday and Sunday, September 30 and October 1. 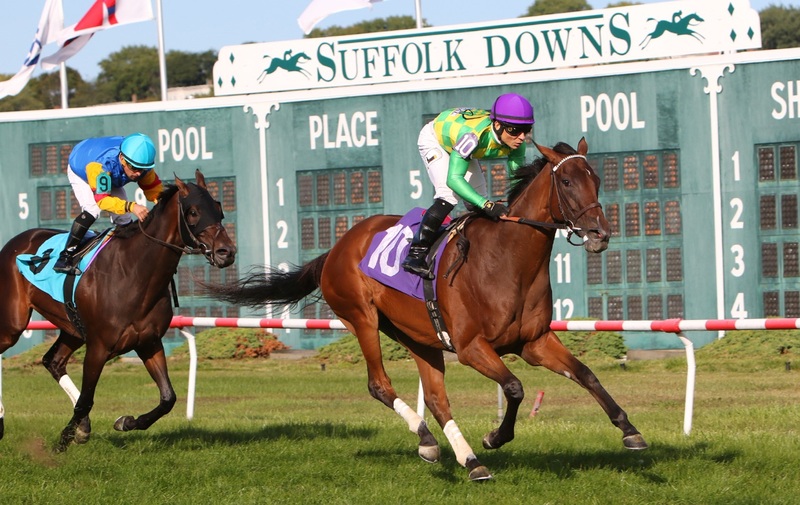 The field of eight in Saturday’s featured race on the turf includes Fuerza, a homebred daughter of War Front for Ramona S. Bass who broke her maiden on September 2 at Suffolk Downs for trainer Michael Matz. She will be facing the Bill Mott-trained Tisbury and Larkin, the Godolphin Racing color bearer trained Michael Stidham. In addition to familiar local jockeys David Amiss and Tammi Piermarini, the featured race has also attracted journeymen riders such as Mike Luzzi and Luis Quinones. On Sunday, the nine-race card will begin with the $50,000 Thomas F. Moran Stakes which is restricted to horses bred in Massachusetts. The seven and a half furlong turf race will feature the defending champion, Danly’s Dream, and multiple stakes winner Dr. Blarney who has won eleven of his fifteen career races. Post time for the nine race card on both days is at 12:35 p.m. and gates open at 11:00 a.m. In addition to live racing, the track will be hosting a food truck festival, craft beers and family fun activities. The 2017 live racing season at Suffolk Downs will have consisted of eight days of live racing featuring $4 million in purses including stakes races for Massachusetts-bred horses. The track intends to operate a similar live racing schedule in 2018. EAST BOSTON, MA – Suffolk Downs concluded the third of four scheduled weekend long live racing and food truck festivals on Sunday, September 3 with the $50,000 Massachusetts Stallion Stakes. Jeb, a five-year-old daughter of Zong bred in Massachusetts by Kenneth Posco, went to post as the favorite and delivered with a 1 ¼ length victory in the six-furlong contest. Ridden by Luis Perez and trained by Dylan Clarke, the chestnut mare contested the early lead before seizing command and drawing off to earn her seventh career victory. Jeb returned $4.80, 3.00 and 2.20. Spectacularsociano paid $3.60 and 2.60 while Brokers Prize paid $2.20. Also on the card, jockey Edwin Gonzalez piloted home three winners on the eleven-race program. Gonzalez kicked off his trifecta in the second race with Golden Story ($7.00) for trainer Michael Stidham. In the third race, he teamed up with Steve Klesaris for a victory with Escape to the Moon ($4.80). He and Stidham paired up again to win the night cap with Sophieshardtocatch ($3.60). The live racing and food truck festivals will continue with the final weekend scheduled to be held on September 30 and October 1. EAST BOSTON, MA – Live racing returned to Suffolk Downs on Saturday, September 2 as the track kicked off the third of four scheduled weekend-long racing and food truck festivals. An enthusiastic crowd of 7,552 was on hand to cheer on Donegal Racing’s Puca to victory in the $75,000 Steve Pini Memorial Stakes. Trained by Hall of Fame conditioner Bill Mott, the five-year-old daughter of Big Brown settled off of the pace and launched a bold move as they turned for home. She drew off to win convincingly under Abel Lezcano and stopped the clock in 1:43 3/5 in the mile and seventy yard turf contest. Puca notched her first black-type victory and returned $7.40, 4.40 and 3.00. Queen Caroline paid $5.20 and 3.20 while Princess of Gibralter (GB) returned $3.00. Mott also sent out Mr. Meister ($6.80) to victory in the ninth race with Wilmer Garcia in the irons. Also on the card, trainer Jay Bernardini and jockey Erik Barbaran teamed up for three winners on the eleven race card. The pair started the day in the opener with So Miesque ($5.40) and swept the early double with Dero D ($7.20). They closed out the card with a front-running victory with Boppin Anda Weavin ($7.40) in the final race of the day. Bernardini took home leading training honors at Suffolk Downs in 2014. The live racing and food truck festival will continue on Sunday, September 3 and again on September 30 and October 1. East Boston, MA — Suffolk Downs will host the third live racing and food truck festival weekend of the summer this Saturday and Sunday, September 2-3. The $75,000 Steve Pini Memorial Stakes will highlight the eleven-race card on Saturday. Also on Saturday, local racing fans will have the opportunity to purchase a commemorative racing program and receive a limited edition Suffolk Downs baseball cap while supplies last. All proceeds will go to the Permanently Disabled Jockeys Fund. Longtime Suffolk Downs-based trainers Jay Bernardini, Karl Grusmark and Brenda McCarthy as well as prominent national outfits including Christophe Clement, Bill Mott and Nick Zito have entered for the weekend’s races. The $75,000 Steve Pini Memorial Stakes is restricted to fillies and mares and is scheduled to be run at a mile and seventy yards on the turf. The black-type race has drawn a field of ten with an additional contender listed as also-eligible. The field includes Puca, a four-year-old daughter of Big Brown who competed in both the 2014 Breeders’ Cup Juvenile Fillies (G1) and the 2013 Kentucky Oaks (G1). In addition to the Steve Pini Memorial Stakes, Saturday’s card will include six turf races. Over the course of the weekend, there will be two stakes races restricted to either horses foaled in Massachusetts or sired by a Massachusetts-based stallion. Each offers a purse of $50,000 and is a showcase for the Massachusetts Thoroughbred breeding industry. There will be many familiar faces taking part in the opening card including popular local jockeys David Amiss, the leading rider at Suffolk Downs in 2014, and Tammi Piermarini, the third most winning female jockey in history. Post time for the eleven race card is at 12:35 p.m. and gates open at 11:00 a.m. In addition to live racing, the track will be hosting a food truck festival featuring food trucks from a variety of local vendors, craft beer, live music and family fun activities for the whole family. Live racing will continue on Sunday with twelve races. The $50,000 John Kirby Stakes will be run as a non-wagering event with a post time of 11:55 a.m.
An additional weekend of live racing has been added to the schedule. Live Thoroughbred racing, food trucks and family entertainment will continue on Saturday and Sunday, September 30-October 1. EAST BOSTON, MA – Live racing returned to Suffolk Downs on Saturday, August 5 as the track kicked off the second of three scheduled weekend-long racing and food truck festivals. Despite early rain, an exuberant crowd of 6,929 was on hand as Bellavais rallied to win the $75,000 Drumptop Stakes. Trained by James Toner and ridden to victory by Michael Luzzi, the three-year-old daughter of Tapit stalked the pace and launched a strong bid on the turn. She hit the lead and drew off to win by 2 3/4 lengths to complete the mile in 1:42 4/5. Toner also won the Drumptop Stakes in 1997 with Gastronomical. Bellavais returned $6.80, 4.00 and 3.20. Notapradaprice paid $14.20 and 5.80 while Cool returned $5.80. Also on the card, jockey Brian Pedroza rode four winners, three of which came for trainer Michael Stidham. The jockey and trainer combination started their successful day in the third race with Great Captain ($4.40) and continued in the seventh race with Golden Story ($8.40). They capped off their day in the eighth race with Charged ($9.20). Pedroza also won the sixth race with Adversary ($7.60) for trainer Rodolfo Sanchez-Salomon. The live racing and food truck festival will continue on Sunday, August 6 and again on September 2-3.